In my.UChicago, click on the Student Services WorkCenter. Within the Academics tab, scroll down to the “Pre-Registration Report”. There are four prompts used in this report. You can use the magnifying glass next to each field if you are unsure of which value to plug into the field. Term: Academic Quarter in which courses are scheduled. Subject: The academic subject related to the parent course offered. 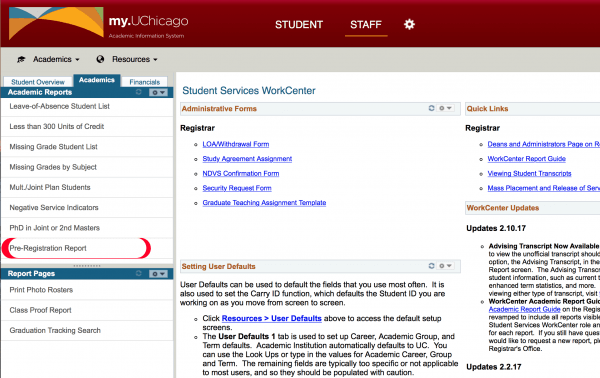 Course ID: In case there is more than one section offered for a course, this can be used to narrow the report to only the courses under that same catalog course ID. Term: The 4-digit term code for the quarter in which bids are granted. Course ID: The unique identifier for each parent course in the schedule of classes. Offer Nbr: Always 1, to indicate the offering is the parent for that course. Course Career: The career associated with the parent offering only. Acad Group: The academic group associated with the parent offering only. Class Title: The 100-character long description of the class. Subject: Academic subject associated with the class. Catalog Number: Catalog number associated with the class. Class Section: The class section number for the parent of that class. Class Nbr: The number associated with the parent section and used for registration. Class Enrollment Status: Blank value indicates the class is Open, Closed status is spelled out. Consent: A value of No indicates no consent, Instructor and Department Consent are spelled out. Section limit: The enrollment capacity for the parent section only. Section Enrollment: The number of students who are enrolled in that section only. Does not include cross-listed enrollments. Combined Limit: When cross-listed, this indicates the entire capacity for that class plus its combined sections together. Combined Enrollment: When cross-listed, this indicates the number of students who are enrolled in all sections that are combined. Pre-Reg Priority: This is the class attribute that indicates whether this class gives preference in order of Fourth-Year, Third-Year, Second-Year, First-Year status (4321) or Second-Year, First-Year, Third-Year, Fourth-Year status (2134). Unduplicated Number of Bids: This is a derived number that counts the number of distinct EMPLIDs that have pre-registetred for a class. If a student has pre-registered for more than one section of a course that was combined, this number will only count the student one time. View Distribution Detail: This is a link that will run a second query once there are students who have pre-registered for a class. If no students have pre-registered for that class, the link will return a blank value. Clicking on the View Distribution Detail link will open a new tab in your browser and show a display similar to what is listed above. There are three undergraduate sections and one graduate section. For each undergraduate section, there is an enrollment limit of three students. Real Time enrollment shows how many students are currently enrolled in that section. So there are a total of 13 seats are taken in the undergraduate sections, plus five seats in the graduate section. The bid distribution in this report is showing how many total pre-registration requests each section received and then a breakdown of the ranking students placed on those bids. Total Section Bids: Number of student who bid on that course section only. View Resolution is a link to another report that gives a break down of the Total number of students who pre-register for that course and how their enrollment was resolved during the resolution phase. If no students bid on a course, this link will be unavailable. Clicking on the View Resolution link for each particular line will give you more details about the students who placed a bid for that particular class/section. Pre Reg Time Period: ID used for the population of students that ran in this process. Student Empl ID: Student’s ID Number. Primary Program: Student’s primary program according to their term activation. Primary Major: Student’s primary plan where sequence = 10. Expected Graduation Date: Student’s primary program expected graduate term. Academic Level: Students academic level according to the start of the term they are bidding on. Advisor ID: Advisor’s PS emplid. Instructor Name: Intructor’s full name. Priority given by student: Rank that student placed on that course. Priority Action Date: Date that student placed the course in their ranking priority list. Student Position: Number generated by the formula used to sort students in the system and process them. Enrollment Message: Any messages used by the system during the enrollment transaction of adding that course. Enrollment Processed Date: Time at which resolution occurred for that student.